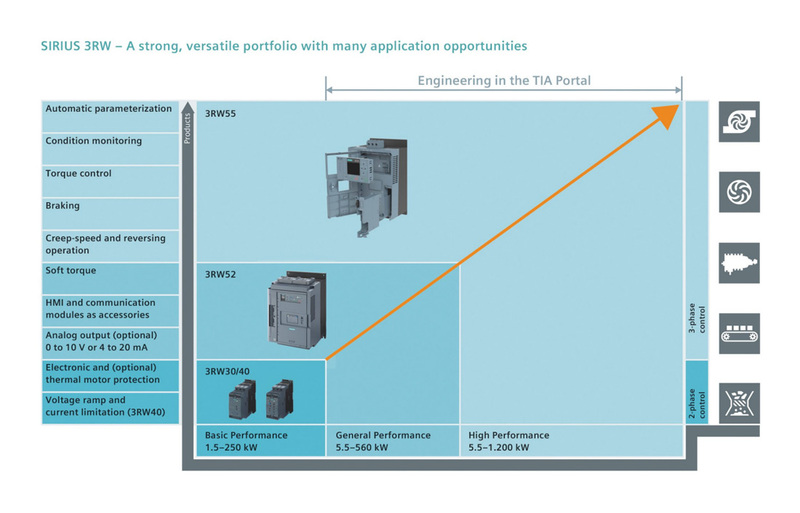 With its Sirius 3RW5 range, Siemens is launching a new generation of soft starters for simple to demanding drive requirements. This comprehensive range of devices for the soft starting of three-phase asynchronous motors from 5.5 to 1,200 kW enables efficient and future-proof machine concepts to be implemented easily and cost-effectively. 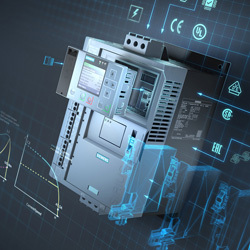 The new Sirius 3RW5 soft starters are suitable for any drive, they can be easily integrated into the automation system, and they supply data right up to 'MindSphere', the cloud-based, open IoT operating system of Siemens. Practice-related functions such as automatic parameterisation with changing start up characteristics, and integrated properties such as electrical ruggedness in the case of fluctuating line voltages, support smooth operation in a host of applications. The new harmonised Sirius 3RW5 soft starter generation offers the right hardware for all requirements as well as individual expansions such as operator panels with and without display (HMIs), or communication via Profinet/Profibus and Modbus. The devices are suitable for global use thanks to numerous certificates and approvals such as IEC, UL and CSA. Tested combinations for the entire motor feeder extend the range of possible uses. The compactly designed enclosure, which won the if-design award 2018, and the coated printed circuit boards contribute to a space-saving and rugged control panel assembly. The new Sirius 3RW5 soft starters can be used in a host of applications thanks to specific functions – from pumping, ventilating and compressing, to moving and processing. In addition, they feature special functions such as starting time monitoring, automatic parameterisation depending on motor start up, pump stop to avoid pressure peaks in piping systems, and condition monitoring with warning and alarm limits. They are also designed to be electrically rugged to fluctuations in line voltages. The new Sirius 3RW5 soft starter generation is fitted with modern hybrid switching technology to ensure efficient switching and energy-saving operation. This enables low-wear switching, extends the service life of the devices and provides mechanical protection for the drive train. The soft starting ensures that the devices avoid current peaks in the power supply system. All in all, using the new Sirius 3RW5 devices enhances the reliability of the application and increases the cost efficiency of the system. A further advantage when using the new 3RW5 generation of soft starters is the provision of data, for CAx tools like Eplan, for example. In addition, the Simulation Tool for Soft Starters (STS) helps the user to make a simple product selection. 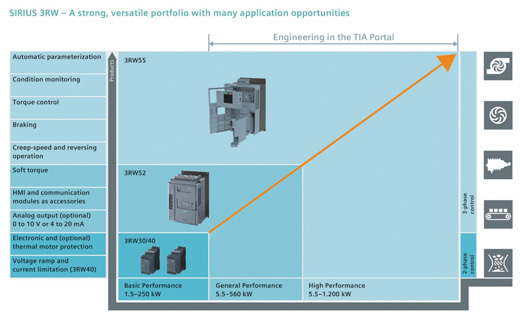 The new 3RW5 soft starters can be configured and commissioned easily and in a standardised manner in the TIA Portal using the Soft Starter ES engineering software. They are simply linked up to the automation system by means of the various communication options. Soft starters limit the starting current and starting torque of drives and electric motors. In this way, mechanical loads and voltage dips in the line can be reduced. The motor voltage is then reduced using phase control and is increased from an adjustable starting voltage up to the desired line voltage within a specific ramp time. The motor is adjusted to the load characteristic of the driven machine by means of stepless control of the voltage supply. Soft starting and stopping reduces the load on connected equipment, and this supports smooth production. Mechanical components are accelerated gently, thus positively influencing operating characteristics, and extending service life. If you would like more information about Siemens Sirius 3RW Soft Starters, download a copy of the brochure on the right or call our Technical Support Engineers on 01254 685900, they will be happy to help.